GROSSMONT COLLEGE—While Grossmont College is a fine institution of higher learning, for many students on campus it is a stepping stone to a four-year university. This is where the Transfer Center in 58-D comes into play. October will be a big month for students looking to transfer to other Universities. Wednesday, October 5, will be College Transfer Day in the main quad of the Grossmont Campus. There will be over 40 colleges and universities represented. “It is important for students to take advantage of this opportunity,” says Transfer Specialist Diane Sandoval. The day will give the students a chance to familiarize themselves with these colleges and universities. Sandoval also encourages students to visit the website http://www.grossmont.edu/transfercenter/ to view other upcoming events. “I wish students would really look at this,” she said. The website features scheduled work shops at which students can get personal attention from Mary Rider, coordinator of the Transfer Center. 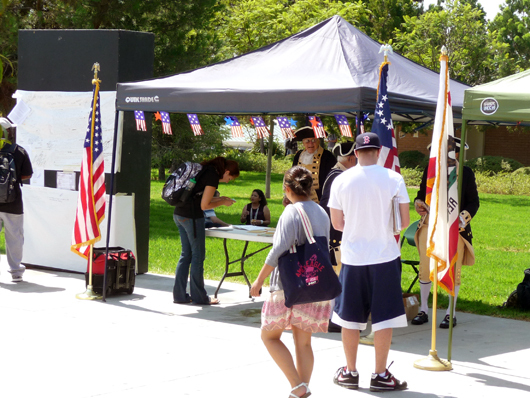 GROSSMONT COLLEGE—Barbecue, free pocket Constitutions, and a chance to meet and pose for photos with Sons of the American Revolution are some of the highlights of the ongoing campus Constitution Week. On Thursday, Sept. 15, Griffin Radio will feature patriotic music courtesy of the Grosssmont College Future Broadcaster’s Association. Also, there will be a lecture on Civil Liberties in the 21st Century given by Dr. Joseph J. Braunwarth, Professor of Political Science, from 9:30-11:00. Thursday also features Phillip Henshaw and Stan Delong representing the San Diego Chapter of the SAR. Descendants of early U.S. settlers, they are easily recognized on campus wearing 18th century American military uniforms in honor of George Washington. The gentlemen say they have participated in Grossmont College’s Constitution Week for the last several years in honor of the patriots who founded the American system of government.